In order to keep one's toothbrush clean and protected from contact with other items, a toothbrush cover is important and easy to use. Most covers are simply slipped over the head of your toothbrush and snapped closed. 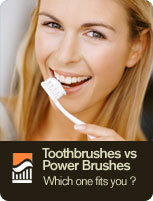 Covers range from standard and small-size toothbrush heads to large or unusually shaped brushes. Toothbrush covers are hygienically effective while traveling or camping, or alternatively, can be a fun way for a child to protect and identify his or her toothbrush when covered in an animal pattern or vibrant color. On a more serious note, studies have indicated that toothbrushes can become seriously contaminated with oral microorganisms. This sort of airborne bacteria can move from toothbrush to toothbrush, particularly because most families store toothbrushes in a common storage space and consequently pass opportunistic infections, such as periodontal disease and the common cold, from one person to another. In this light, a cover can provide more protection than a common holder bearing several community holes. Howard S. Glazer, DDS, FAGD, spokesperson for the Academy of General Dentistry, advises: "The easiest way to protect your toothbrush is by using a toothbrush cover". Because sprayed water, contact with skin, and toothbrush collision are all circumstances that contribute to bacterial spread, Dr. Glazer goes on to recommend that that one thoroughly rinse the bristles, shake off excess moisture and then store the brush upright before placing a cover over the toothbrush head.